To avoid pain, be sure to organize your working time on the instrument, to respect the breaks, it is essential. This table will help you. Download it for free. 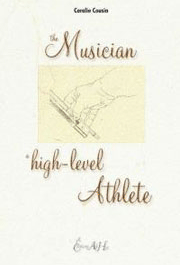 From warming up to dealing with stress before a competition, Coralie Cousin, physiotherapist for musicians and specialist in musicians'health issues such as pain and tendinitis, tells you everything in her book « The Musician a high-level Athlete ». Aimed at musicians experiencing pain due to extensive practice of their instrument, this book contains thorough advice with illustrations so that readers feel confident about putting the suggestions into practice. A graduate in physiotherapy, Coralie Cousin has been a specialist in the retraining of musicians' hands for twenty years. She has opened her own « Musicians Clinic » in the 13th district of Paris in France. She has treated over 3 000 musicians and is the official therapist for musicans at the renowned École Normale de Musique de Paris Alfred Cortot as well as for the National Orchestra d'Ile-de-France. Through numerous articles, conferences and interviews on radio and television, she offers help and guidance to musicians in order to prevent musculoskeletal disorders. 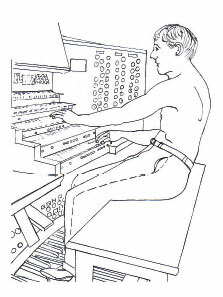 Good - Bad posture and gesture at the Organ. Coralie Cousin : Musicians' Physical Therapist; what is the purpose of your work? Organists, like high-athletes, make demands on their bodies without always being aware of the consequences. The goal is to find a physical balance between energy and relaxation, which is absolutely necessary to playing an instrument. Due to my work with Olivier Latry, professor of Organ at the conservatory in Paris, I have been able to learn much about the extremely complex techniques of organ playing. 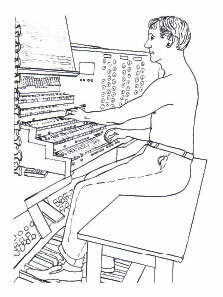 The organ is a very physical instrument; during his performance, the organist makes a tremendous amount of movements due to the great number of pedals and pistons for the feet, while the hands need to reach one of the keyboards of the console. Before discussing injuries, you must realise that this instrument involves the whole body. Good posture is indispensable. It isn't so much the repetitive motions that cause muscular tissue trauma; what is dangerous is to execute them with bad posture and reduced amplitude. The most frequents pains are situated in the upper spinal column of the neck and in the shoulders, predominantly on the left side of the body, which experiences intense demands from the repertoire. The frequent overweight on the left side of the keyboards tires the left hand more quickly, so tendonitis of the left wrist is common and very often associated with pain in the left shoulder. It is indispensable to take your time, concentrate on posture, and not rush to the instrument. Sitting is all about the even distribution of your body weight: Try to sit towards the centre of the bench, as if you were about to get up. If you can, adjust the height of the bench according to your morphology, but you should also be aware that it might depend on the piece you are about to play. In addition, the bench is not always adjustable. The important thing is not to be too close to the instrument. Position your axis without modifying your anchor points and oscillate freely around this axis, giving more importance to the flexion of the torso on the hips. Place your rib cage correctly and then exhale while stretching yourself towards the sky; you must think of your body as elongating smoothly, as if the air you are blowing is helping carry the music to your audience. Raise your arms without modifying your anchor points, or the axis of your body. Sitting, this movement of the arms must seem weightless. The weight of your body is not distributed correctly on its anchor points that are static. Your shoulder line becomes imbalanced. If you raise your arm, it is heavy. Please note: an asymmetric sitting position can cause a deviation of the spine together with a rib cage which is closed and off axis. This may stop you from breathing correctly. You're arching your back to keep upright. This is a common mistake: you don't lean on your feet to help yourself, you try to make yourself taller, and you are seated at the edge of your chair. You throw your head forward because of your arched back, creating tensions in your neck. You pivot your pelvis backwards, rounding your back and closing your shoulders. Your bad position at the instrument is responsible for stiffness in the rib cage. It is off axis and you are unable to breathe correctly. Important : You will repeat this movement of lifting your arm a countless number of times. It is your centre that is leading you, and not your hand: that is what has to register in your mind. Always remember that your body works as a whole unit. If before playing, you let yourself go by applying a force towards the earth, one must absolutely correct this, as it is a misinterpretation of the body. You often do this believing that you are relaxing, but in fact it has nothing to do with the physical sensation of releasing. When Christiane wanted to hold herself upright, she arched her lower back, which tilted her pelvis forward, thus creating huge tension in her neck and shoulders. She asked me for advice. She wanted to be in good physical condition when the time came for her to retire so as to be able to play and learn new pieces. Over time, she had brought her bench forward, thus compressing the range of her movements. Reducing the space between the musician and his instrument is a common mistake, which contributes to altering the muscular memory of the body. « Even if the movement is small, I hear it in a big way » says Christiane. « To think big also expands your range of tonal colours ». I watched Christiane play the organ and asked her to move her bench back slightly, so that she could sit a little less on the edge of it. At first, Christiane was completely thrown off balance. She felt as if she were falling. We then worked on the tilt of her pelvis, the locking of her lower abdominal muscles, and concentrated on reintegrating hip flexion from the torso. I was adamant about wanting her to recover the scope of her movements, as it is this that allows one to bend towards the score without breaking the motion, especially around the neck. Christiane was soon able to read music again without experiencing pain in her neck, and increased her playing time from 30 minutes to one and a half hours, her progress continued. After 10 sessions, everything was back to normal. Being aware of good posture is a long process that evolves over time with the changing morphology of our own body over the years. So it is a constant challenge, just as much as the interpretation of a musical work. But it is extremely difficult to have sufficient perspective on one's own technique and position, and this is where the musician's physiotherapist must intervene, not only to heal, but also to prevent pathologies that could become more or less long term issues. The work done with Coralie over a number of years turned out to be of the utmost importance for me because it allowed me to make certain adjustments that I could never have accomplished alone. I don't know if I'd still be playing the organ today without this help. So thank you, Coralie, for your knowledge and your charisma. May your experience serve new generations of musicians as it has served me!